A neat idea from LG, but one you feel still needs a little more work to start a new chapter in the VR story. LG's Dr Ramchan Woo, VP of product planning at the brand, hates VR at the moment. It's too bulky, he says, and ruins his hairstyle. So that's why LG's made the VR 360, a headset that clocks in at just 117g and is designed to be portable and slimline, where other VR sets are large and require too much extra effort to use. Created for use with the LG G5 only (it's tethered to the phone by a wire that connects to the USB Type-C port, something no other phones in the LG line have) it's a slimline VR experience that takes elements from YouTube 3D and Google Streetview and fuses them with a little bit of custom skinning from LG. It's being tipped as a lightweight version of what's out there already, but in reality it's a cut down version of the something like Samsung's Gear VR, with a small selection of screens to choose from in your eyeline. In terms of design, it's not the most comfortable to wear, as despite the really sleek lines (you look more like a Star Trek extra than VR wearer... although I'm not sure which is preferable) the overall effect is quite hard on the nose and the arms dig quite hard into the side of your head - it doesn't feel like it would be comfortable to wear. What is good is the automatic switching: plug it into the phone and plonk it on your face and you'll be instantly into the VR world, with the aforementioned options already there. This means you can view your downloaded 360 movies (which you'll have precisely zero of) or see your 2D videos from the 'comfort' of a cinema seat, with the main screen showing your choice. There's no Netflix on offer here (again, unlike the Samsung Gear VR) so you're forced to watch a slightly blocky version of your own videos. The experience isn't that great either - LG's Woo said that the resolution was the same as other on the market, but it's hard to feel that the slimline 1.88-inch screens, packing 720p resolution each, are the equal of the 1920 x 1080 res of something like the HTC Vive. 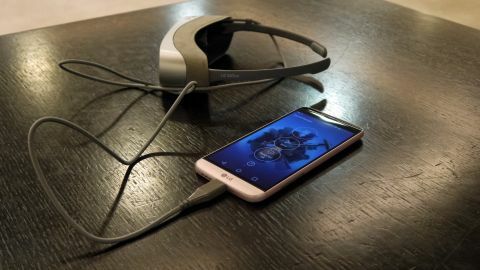 There are some real wins here: you can charge the headset from the phone, the slimline design is something that's not been seen on the market and there is content available from Google and YouTube already - and you don't need to have a phone shoved in front of your face. But the slim design doesn't feel immersive enough for me - this is a lightweight headset, but not something that performs as it should. The LG VR 360 is a novel idea, and one that I like to see cooked up - but in reality, it's not even virtually there. The experience with VR needs to either be mind-blowing (as is the case with HTC's Vive or Sony's Playstation VR) or super cheap and easy (which is what Google Cardboard offers) - and this falls somewhere in the middle. There's a nugget of a good idea here - it's just that the design of the headset feel too plastic and uncomfortable for a long period of time.